MAKE THE NEXT PHASE OF AGITATION ALSO A THUNDERING SUCCESS. An urgent meeting of the National Executive of the Confederation of Central Govt. 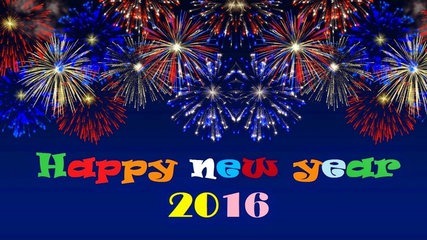 Employees & Workers will be held at ITEF Head Quarters (Rajouri Garden), New Delhi on 12-02-2016 (12th February 2016 - Friday). The meeting shall commence at 10.30am and continue till close. National Secretariat members, Chief Executives of the affiliated Organizations, General Secretaries of all State level C-o-Cs and main Office bearers of the Women's Sub Committee are requested to attend the meeting. 1. 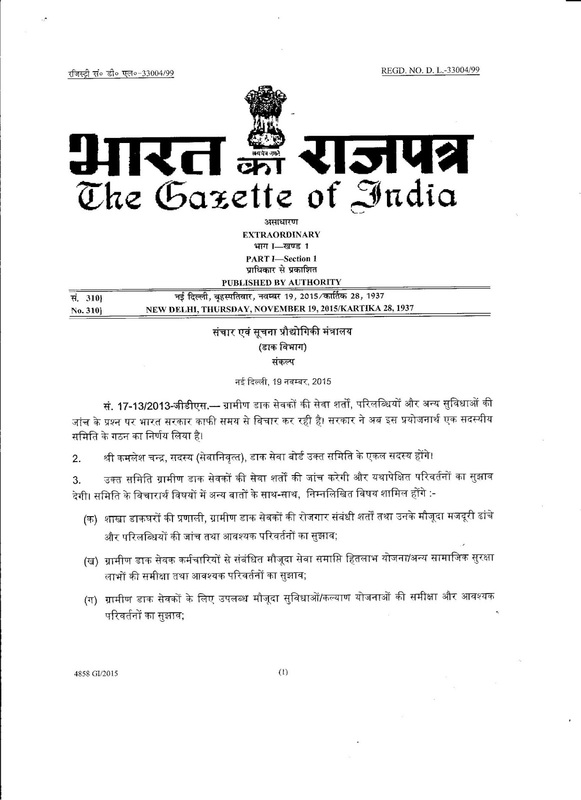 7th CPC related issues and proposed indefinite strike by NJCA. 2. Two days All India Workshop of Confederation at Dehradun (Uttarakhand) – Finalisation of dates & Programme. 3. All India Conference of Confederation & All India Women Convention at Chennai (Tamilnadu) – Finalisation of dates. 4. Financial position of Confederation – Decision for improvement. 5. Issues relating to the affiliated Organizations. 2. Chief Executives of all affiliated Organizations. 3. General Secretaries of State C-o-Cs. Kindly refer to your circular letter of 21st December, 2015 wherein you have reiterated the decisions taken at the meeting of the NJCA on 8th December, 2015. 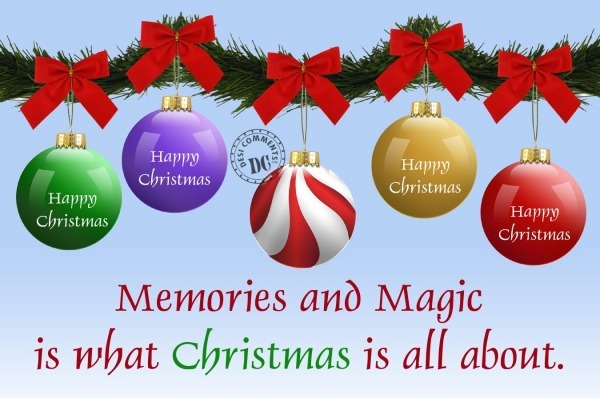 We have already advised our affiliates to carry out the programmes slated for 30th December, 2015 and 19 to 21st January, 2016. The employees have realized that the report of the 7th CPC is the worst ever in the history of wage revision of the Central Govt. employees. They have also realized that a show down is inevitable to change the situation. We feel in the given situation, it is the bounden duty of NJCA to provide leadership, unite the employees and lead the struggle, which alone can bring about tangible improvements. Though for the Confederation and its affiliates, strike ballot is not mandatory, we shall go through the process for it will enable our State and District level leaders to explain the various retrograde recommendations of the 7th CPC to the rank and file of the membership. We, however, feel that the strike ballot, if taken say by the end of January, will help us to create a salutary impact at the time of discussions. We also feel that the Government might hold consultation with us only once at the level of the Cabinet Secretary. 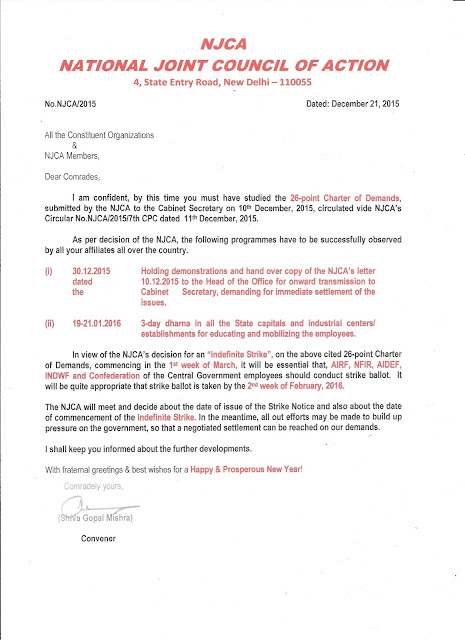 Besides, As per the decision of the meeting of NJCA of 8th December, 2015, we are to conclude the negotiation with the Government by the first week of February so that we would be able to declare the date of strike in the slated meeting of the NJCA on 8th Feb. 2015. In the circumstance, we suggest that the decision for the strike ballot may be taken immediately and the same is concluded by the end of January, 2016 i.e., before the declaration of the date of commencement of indefinite strike. You may kindly hold discussions with the NJCA members over the phone and if agreed upon take appropriate decision to hold the strike ballot by the end of January, 2016. We make this request for it may pose some difficulties for us to go in for the strike ballot later than January. 2016. PAYMENT OF TRANSPORT ALLOWANCE TO CENTRAL GOVERNMENT EMPLOYEES POSTED IN OFFICES LOCATED AT FARIDABAD, GHAZIABAD, GURGAON AND NOIDA. Com. (L) Bah A. M. Syiem, Working President COC, Meghalaya expired on 15.12.2015. Confederation CHQ deeply condoles the untimely demise of Com. (L) Bah Syiem. Com. Vrigu Bhattacharjee Financial Secretary Confederation of Central Government Employees & Workers (CHQ) and Secretary General Civil Accounts Employees Association has been nominated by Government as Member JCM National Council Staff Side . This is the first time Civil Accounts Employees Association is getting a seat in JCM National Council. Com. S.M.A. Jinnah (68), former Secretary General, All India Audit & Accounts Assn. (1988-1991)expired on 14.12.2015 night. . He was hospitalized for multiple ailments. Confederation CHQ conveys its heartfelt condolence. Hold demonstrations on 30.12.2015 in front of all offices and Submit copy of the Charter of Demands to Head of offices for onward transmission to Cabinet Secretary. Conduct three days Dharna at all state capitals and Industrial Centres/Establishments on 19th, 20th & 21st January 2016. NJCA will meet on 8th February 2016 to decide the date of commencement of indefinite strike. INDEFINITE STRIKE FROM 1st WEEK OF MARCH 2016 – SECRETARY, JCM (NC) STAFF SIDE WRITES TO GOVERNMENT. 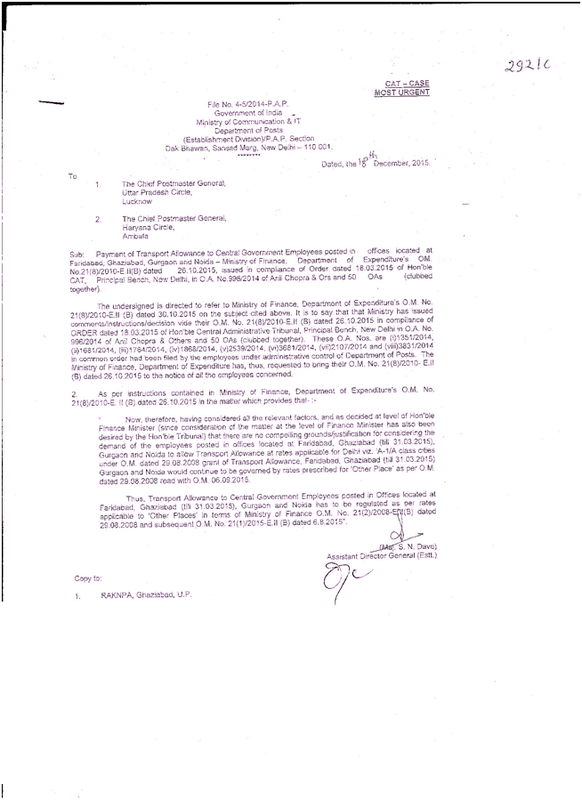 Click here to view Letter to Govt. Sub: - Grant of Flood Advance and other Financial Assistance for the staff including Gramin Dak Sewaks and Casual, Part-Time, Contingent employees who suffered substantial loss during the recent flood in Tamilnadu – Reg. As you are aware that, there was torrential rain and catastrophic flood in Tamilnadu for the past three weeks and almost the Chennai City is devastated. Likewise, many areas viz. Cuddalore, Kanchipuram, Tiruvallur Districts and Puduchery union territory are the most affected parts of Tamilnadu during the recent flood. Water logged even in Airport, Railway Stations, National Highways etc. and almost every connecting link is severed and no vehicle service for the past several days in the City . National Disaster Management Team, Army, Navy and Air Force personnel are deployed for rescue operations and death toll crosses 188, as per official figure. The Prime Minister of India recently visited Tamilnadu to make a personal survey of flood affected areas, described this as a National Disaster and announced Rs. 1000 Crores as immediate relief from the National Disaster Response Fund for rehabilitation works. The Tamilnadu State Govt. and Puduchery Union territory Govt. have announced the above mentioned areas as flood affected and various kinds of assistances/relief are extended to the affected people. It is therefore requested to take necessary action so as to grant natural calamity advance to all the affected Central Government Employees, including Gramin Dak Sewaks and Casual, Part-time and Contingent employees, those who are residing in the flood affected Districts of Tamilnadu State. Moreover, it is requested to take suitable action to grant Financial Assistance liberally to those officials/GDS/Casual Labourers who suffered with substantial loss of movable and immovable properties due to flood. Meeting of the National Joint Council of Action (Railways, Defence and Confederation) was held on 08.12.2015 at JCM National Council Staff Side office, New Delhi. Detailed deliberations on 7th CPC related issues (including Gramind Dak Sewaks and Casual, Contract and daily-rated workers) was held and a Common charter of demands was finalized. It is further decided that the NJCA shall go on indefinite strike from the 1st week of March 2016, if the Government fails to reach a negotiated settlement with the staff side before 1st week of February 2016. A letter intimating this decision will be given to the Government shortly along with the common charter of demands. Letter to Government and charter of demands will be published in the website within two days. Your kind attention is invited towards my earlier letter of even number dated 27th November, 2015, wherein it was advised that next meeting of the NJCA will be held in JCM Office, 13-C, Ferozshah Road, New Delhi, at 17:00 hrs. on 8th December, 2015, to discuss and decide the strategy for getting implemented report of the VII CPC. It would be quite appropriate, if you kindly send us your valuable input, enabling us to include the same in the discussion and preparation of the memorandum, to be submitted to Government of India, seeking improvements in the VII CPC report. Please read the following order and communicate to your Departmental heads, the modifications required in the Department specific recommendations of each Department. Regarding common demands JCM (Staff Side) will submit its views to the Government for modifications. 7. 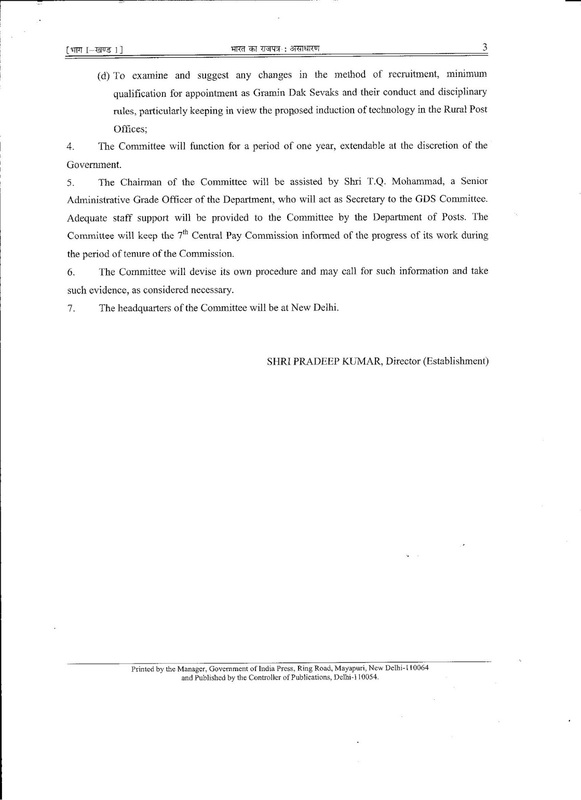 All affiliated organizations of Confederation are requested to intimate by e-mail to the Confederation CHQ (confederationhq@gmail.com or mkrishnan6854@gmail.com) on the required modifications or additions / deletions in the common recommendations (not department-specific) of the 7th Pay Commission on or before 05-12-2015. TO EXPRESS OUR ANGER, RESENTMENT AND STRONG PROTEST AGAINST THE REJECTION OF THE LEGITIMATE DEMANDS OF THREE LAKHS GRAMIN DAK SEVAKS BY THE NDA GOVT. The Federal Secretariat of NFPE held at NFPE Office, New Delhi on 26-11-2015, reviewed the whole situation prevailing among the postal employees in general and the Gramin Dak Sevaks (GDS) in particular after the submission of the 7th Central Pay Commission Report to the Govt and also after the appointment of a separate committee for GDS by the Govt, headed by a retired Postal Board Member as Chairman. The Federal Secretariat further reviewed the proposed two days strike call given by NFPE and AIPEU GDS (NFPE) for realization of the legitimate demands of the Gramin Dak Sevaks, which include bringing the GDS also under the purview of 7th CPC treating them as Civil Servants. The main demand of NFPE and AIPEU GDS (NFPE) in the charter of demands submitted to Govt and Postal Board is “inclusion of GDS under the purview of 7th CPC”. NFPE organized series of agitational programmes for the GDS demands including dharnas, hunger fast, GDS Parliament March, Parliament March under the banner of Postal JCA (NFPE & FNPO), one day strike on 12th December 2012 and 48 hours strike on 12th & 13th February 2014. 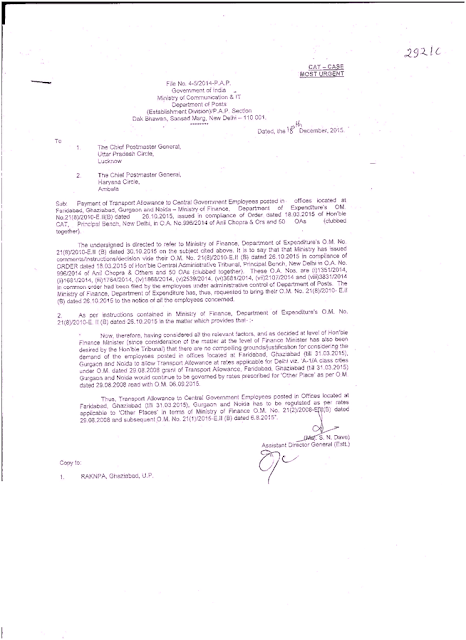 Due to our agitational programmes the Postal Board was compelled to submit the proposal for inclusion of GDS under 7th CPC to Finance Ministry with favourable recommendations. But the Finance Ministry rejected the proposal three times and it is in this background NFPE & AIPEU GDS (NFPE) decided to go for two days strike on December 1st & 2nd demanding the Govt to include GDS under the 7th Pay Commission. Even though the Govt refused to include the GDS under the 7th CPC, the 7th CPC has suo moto examined the main demand of the GDS ie., treating them as Civil Servants and extending them all the benefits of the departmental employees, ofcourse proportionately. It is most unfortunate that the Pay Commission headed by a retired Supreme Court Justice as Chairman, has considered our demand and categorically stated that Gramin Dak Sevaks are holders of Civil Posts but outside the regular civil service and hence can not be treated at par with other civilian employees. After this observation of the Seventh CPC even if the GDS are included in the 7th CPC they are not going to get a fair deal. This has compelled us to modify the demand placed by us before the Govt in the charter of demands. NFPE, from the very beginning has opposed the appointment of an Officer Committee for GDS and NFPE & AIPEU GDS (NFPE) has tried their best to prevent appointment of an Officer Committee and compelled the department to make effort for inclusion of GDS under 7th CPC itself. But now NDA Govt rejected our demand and has unilaterally appointed GDS Committee with a retired Postal Board Member as Chairman and cheated three lakh GDS employees. From our past experiences we know that the retired officers of the Postal Department will never do justice to the Gramin Dak Sevaks. 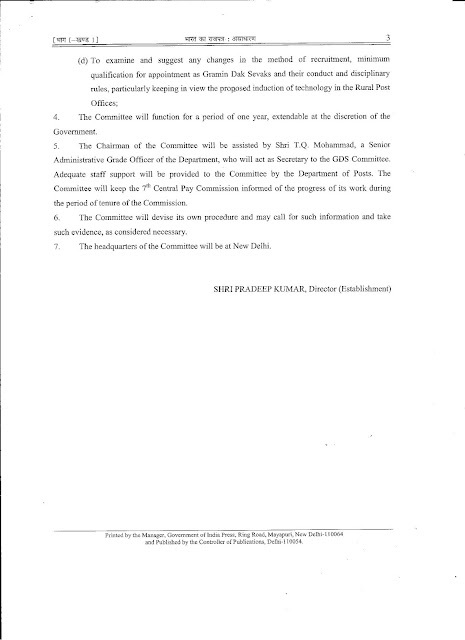 In view of the fact that 7th CPC has rejected our demand for Civil Servant status and also the Govt has unilaterally imposed the officer committee on GDS, the Federal Secretariat felt that it is not appropriate to go for an immediate strike with the demands raised by us in the charter of demands, i.e., inclusion of GDS under 7th CPC. Now GDS can get justice only if NDA Govt take a policy decision to regularize the services of GDS treating them as Civil Servants. Federal Secretariat is fully aware that we can not expect such a decision without the change in the policy of the Government towards GDS. 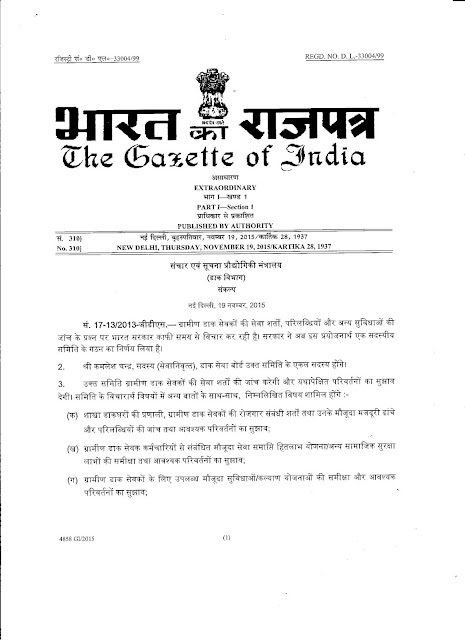 To make a change in the policy decision of the Govt., a bigger mobilization and strike of all postal employees including GDS with the active support and solidarity of other central Govt employees under the banner of Confederation of Central Govt Employees and workers and also the JCM National Council Staffside organizations is required. The Federal Secretariat decided to explore all possibilities and wider consultations for such a united struggle. The Federal Secretariat felt that to pave way for wider consultations, the independent strike call of NFPE & AIPEU GDS (NFPE) need to be deferred and all likeminded organizations are to be brought under a common platform. Accordingly Federal Secretariat unanimously decided to defer the proposed two days strike scheduled to be held on 1st & 2nd December 2015. The Secretary General and all General Secretaries of NFPE shall sit on two days hunger fast in front of Dak Bhawan, New Delhi on 1st & 2nd December 2015 expressing our strong protest to the Govt and also demanding regularization of Gramin Dak Sevaks by granting them civil servant status with all consequential benefits of regular employees. The Federal Secretariat, while saluting the grass root level workers for their intensive campaign and preparation for the strike, calls upon them to organize one day hunger fast infront of all CPMG / PMG and Divisional Offices throughout the country on 11th December 2015 to ventilate our anger, resentment and strong protest against the callous and inhuman attitude of the NDA Govt towards three lakh Gramin Dak Sevaks who are the backbone of the Postal Department catering to the needs of the rural population of this country in postal sector. Federal Executive of NFPE will meet shortly to review the situation and shall decide future course of action. In the heyday of Indian socialism, the perception of government was benign. In today’s climate of liberalisation, the government is viewed with hostility. That must explain the negative reaction both in the media and amongst the public at large to the increases in pay for Central government employees recommended by the Seventh Pay Commission (SPC). The pay hikes are modest — embarrassingly so in comparison with pay increases and bonuses in the private sector. Yet, media reports talk of a ‘bonanza for babus’. The impact on the fiscal can be easily digested by the Indian economy. Yet, analysts warn of slippages in the fiscal deficit, a possible boost to inflation, and a setback to public investment. Do we want to run the government — which comprises not just civil servants but the police, armed forces, nurses, doctors, regulators and academics — at all? Or have we persuaded ourselves that all of the government is simply money down the drain? The SPC’s figures don’t come out of nowhere. The Commission has a rigorous basis for setting pay in government. It arrives at a figure for minimum pay in government with reference to norms laid down by the 15th Indian Labour Conference (ILC) in 1957. The ILC had said that the minimum wage should cover the basic needs of a worker and his family, that is, a spouse, and two children who are below the age of 14. The SPC has spelt out the norms it has used for determining basic needs. It has gone by food requirements specified by a well-known nutritionist. To this are added provisions for clothing, fuel and lighting, education, recreation, festivities, medical expenses, and housing. There is an addition of 25 per cent to the total of the above to provide for the skill factor (the basic needs having been determined for an unskilled person). The SPC report provides detailed computations for each of these items. No reasonable person can accuse the SPC of being overgenerous. Based on these norms, the SPC arrives at a minimum wage of Rs. 18,000 for a government employee. This is 2.57 times the minimum pay in the Sixth Pay Commission. The increase over the projected pay on the current basis as of January 1, 2016 is 14.3 per cent. This is the second lowest increase recommended by any Pay Commission since the first one, and it is way below the 54 per cent increase following the last one. The multiplication factor of 2.57 is used to arrive at pay for all levels of government except for a few at the top where a slightly higher multiple is used. As before, pay at the lower levels of government is higher than in the private sector; at the top, the position is reversed. In today’s context, this may not be a bad thing at all. Pay in the private sector today is contributing towards massive inequalities in Indian society. Having a very different structure in government is a useful corrective to trends in the private sector. It will help contain tensions created by rising inequality. So far as the impact on government finances is concerned, the SPC numbers provide a stream of good news. First, the impact of the pay hike on the Central government (including the railways) will amount to 0.65 per cent of GDP. This is less than the impact of 0.77 per cent of GDP on account of the Sixth Pay Commission. Second, the impact on the Central government (excluding Railways), which is what matters when it comes to the Union budget, is 0.46 per cent of GDP. As some of the increase in salary comes back to the government as taxes, the impact, net of taxes, will be even less — say, 0.4 per cent of GDP (assuming an average tax rate of around 20 per cent on government pay). This is a strictly one-off impact. The correct way to view it, therefore, would be to amortise it over a period of, say, five years. The annual impact then is 0.08 per cent of GDP. The impact on the fiscal at the central level is barely noticeable. Trends in the wage burden in the government are worth noting. Pay and allowances in the Central government have remained stable since 2010-11 at around 1.8-2.0 per cent of GDP. Thus, pay and allowances have been rising at roughly the same level as nominal GDP or 11-12 per cent. This is the increase after taking into account increments, adjustments for dearness allowance and promotions. In the private sector, such an increase would be considered laughable at all but the lowest level. Pay, allowances and pension (PAP) as a proportion of government expenditure has been declining sharply. In 1998-99, PAP was 38 per cent of revenue expenditure. The SPC estimates that this figure has fallen to 18 per cent in 2015-16. (It will go up to 22 per cent in 2017-17 consequent to the SPC award, but will decline thereafter, as pay grows at a lower rate than government expenditure). The implication is striking: in financial terms, the workforce in government has been effectively downsized by nearly half over the past 17 years. The SPC substantiates its point by comparing India’s Central government workforce with that of the federal government workforce in the U.S. In 2012, the non-postal civilian workforce in the U.S. was 21.3 lakh. In India, the corresponding figure in 2014 was 17.96 lakh. The number of personnel per lakh of population in India was 139 in 2014, way below the figure of 668 for the U.S. India’s bureaucracy needs not so much downsizing as right-sizing — we need more doctors, engineers, IT specialists, tax experts, judges, and so on. The government is not bound by the SPC’s recommendations. It can opt for higher pay hikes as happened with the previous Pay Commission. Assuming the government goes along with the SPC, what impact on growth can we expect? Increased pay for government employees means greater government expenditure and hence a fiscal stimulus — provided government expenditure on other counts is not reduced and the fiscal deficit rises. This happened at the time of the Sixth Pay Commission. Higher wages for government employees contributed to a higher fiscal deficit and helped stimulate growth in the short run. This time round, the Finance Ministry insists that it will stick to its fiscal deficit target for 2016-17 after providing for the SPC pay hike. If it does so, the reduction in fiscal deficit will be contractionary. Hence, the pay hike will not lead to economic expansion in the aggregate. However, greater income in the hands of government employees could favourably impact sectors such as the real estate, automobiles and consumer goods. 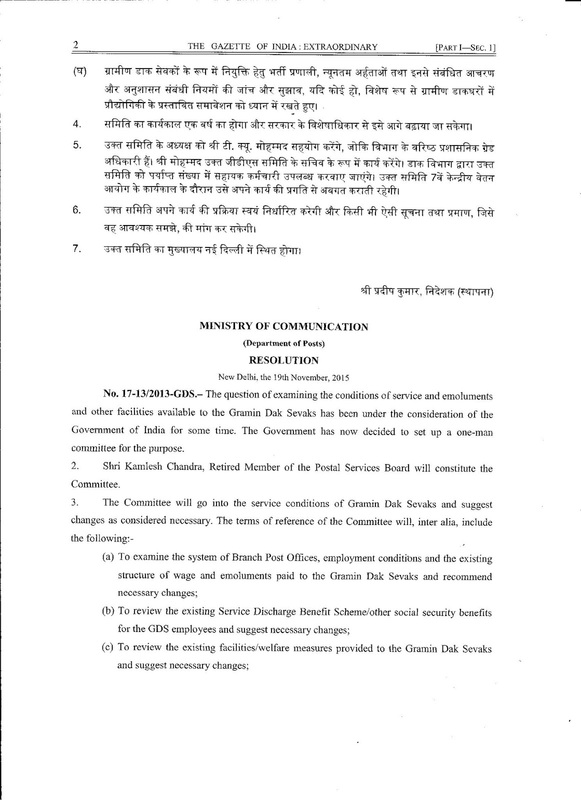 NOTIFICATION OF GDS COMMITTEE HEADED BY RETIRED MEMBER POSTAL SERVICES BOARD ISSUED BY THE DEPARTMENT OF POSTS.